Noah Gragson, driver of the No. 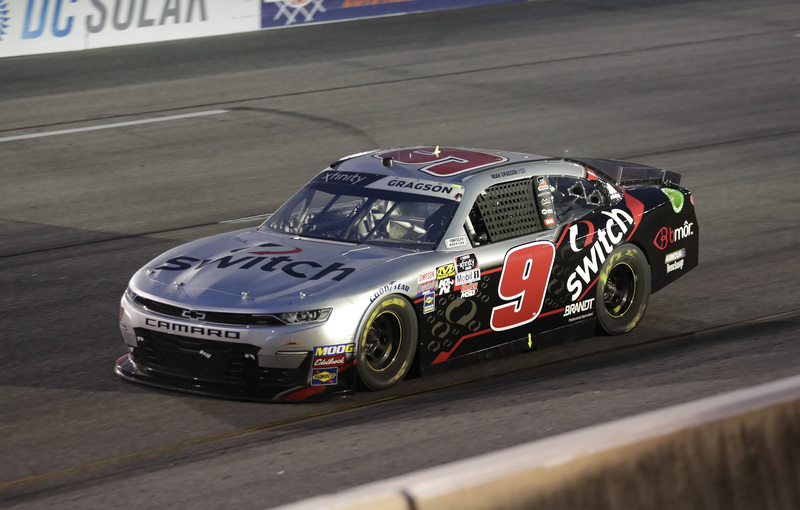 9 Switch Chevrolet Camaro, ran inside the top 10 for much of Friday evening’s NASCAR Xfinity Series event at Richmond Raceway, earning stage points in both Stage One and Two before an incident following a lap 218 restart ultimately relegated the JR Motorsports driver with a 22nd-place finish. The fastest driver in Friday morning’s lone practice session lined up for the 250-lap event from the 12th position after rain forced NASCAR to cancel qualifying and set the field by owner points, per the rulebook. From the drop of the green flag the driver of the Switch Chevrolet pressed forward, racing into the top 10 for the first time on lap 13 and up to the fifth position by lap 35. Gragson continued to fight for position inside the top five until a lap 64 caution provided crew chief Dave Elenz with the first opportunity to bring the Las Vegas, Nev. native to pit road. After pitting for four tires and a chassis adjustment, Gragson returned to the track for the lap 70 restart in the sixth position and took advantage of the outside line to race into fourth as the first stage came to a close on lap 75. With the stage result, Gragson earned seven valuable points. The driver of the Switch Chevrolet took the green flag for the beginning of Stage Two from the fourth position after the team opted to stay out following the opening stage. Once underway, Gragson maintained his position inside the top five until at tight-handling condition developed rolling through the center of the corner. However, a lap 126 caution gave Elenz another chance to bring Gragson to pit road for four tires and a chassis adjustment in the hopes of alleviating the tight condition. Heading back out in 12th following the stop, Gragson made a three-wide move entering Turn 1 that moved the 22-year-old driver up to seventh. The JRM driver’s climb forward didn’t stop there, as Gragson improved one more position after narrowly avoiding a sliding Christopher Bell to end Stage Two in sixth, earning an additional four stage points in the process. Prior to the beginning of the third and final stage, Gragson was called back to pit road for four tires and another round of adjustments, lining the Rookie of the Year contender up in the sixth position for the lap 160 restart. Gragson maintained his top-10 track position throughout the green flag run that followed, despite reporting to Elenz that the Switch Chevrolet had gotten loose both on the entry and exit of the corner. Although not handling to his liking, Gragson pressed forward. Then, following a lap 211 caution period, Gragson and the No. 21 of Kaz Grala made contact while battling for a top-five position, sending the Switch Chevrolet sideways through Turns 1 and 2. As a result of the contact and subsequent spin, Gragson was forced to return to pit road for four tires and some slight repairs. With the track position gone, Gragson fought for all he could in the closing laps before taking the checkered flag in the 22nd position. Cole Custer earned the victory, with Austin Cindric, JRM teammate Justin Allgaier, Tyler Reddick and Ryan Sieg rounding out the top five.